Julie Jansen works the night shift. 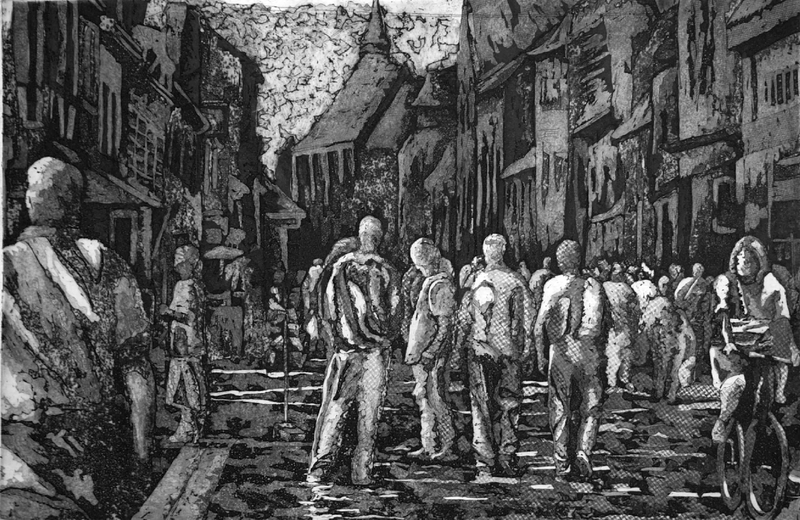 A crowd adrift in the city, by Amy Oates. T-town shows a different face at night, and that’s especially true of the Woolworth Building – that Edward Hopper-esque structure whose illuminated windows attract passersby with beauty like some half-forgotten memory. The Woolworth windows on Broadway and Commerce are filling with new art installations. 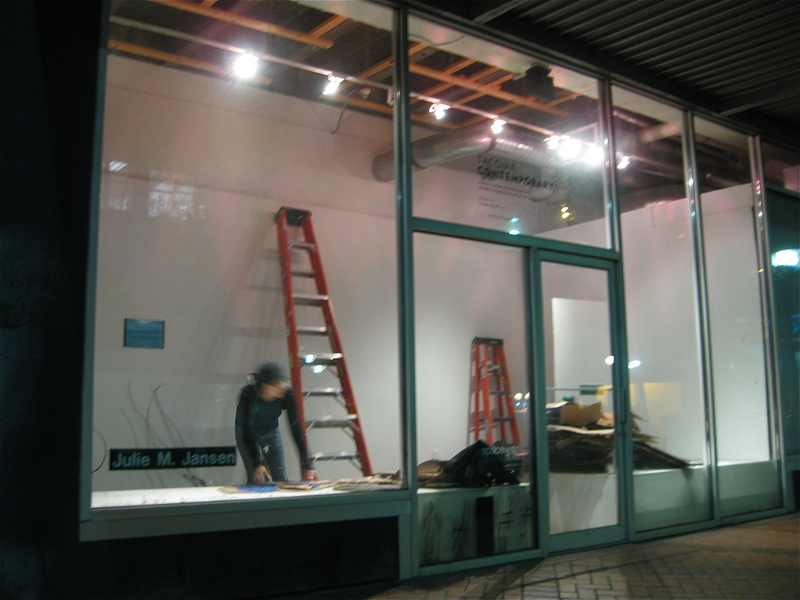 Tonight, we spotted Portland artist Julie Jansen burning the midnight oil while setting up her Artscapes exhibit, a meditation on invasive species. "Brasov, Romania," by Amy Oates. 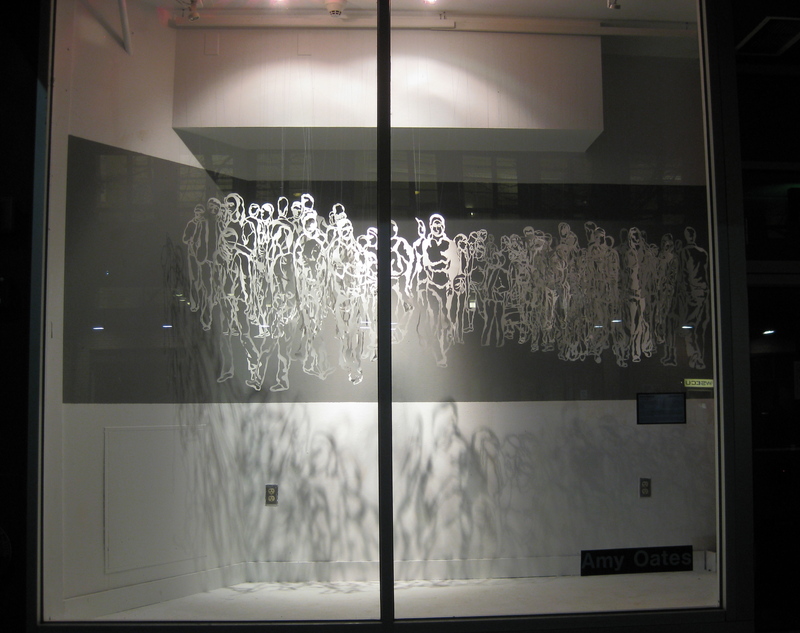 Oates’ group of cut-out figures seems to be suspended in no particular time or place. “It is probable that any observed crowd will never be seen in the same location and spatial relation again. Individuals are mobile and transitory, and at the [same] moment ‘of the crowd’; nameless and faceless [amidst] unmoving space. Yet, the city – that static dot on the map – is formed, altered, and sustained by anonymous persons, fleeting moments, rubbed shoulders, blocked views, stuffy spaces, converging paths, and diverging destinations,” she explains. Take a nighttime stroll at Woolworth’s and witness this and other dramas of urban life.